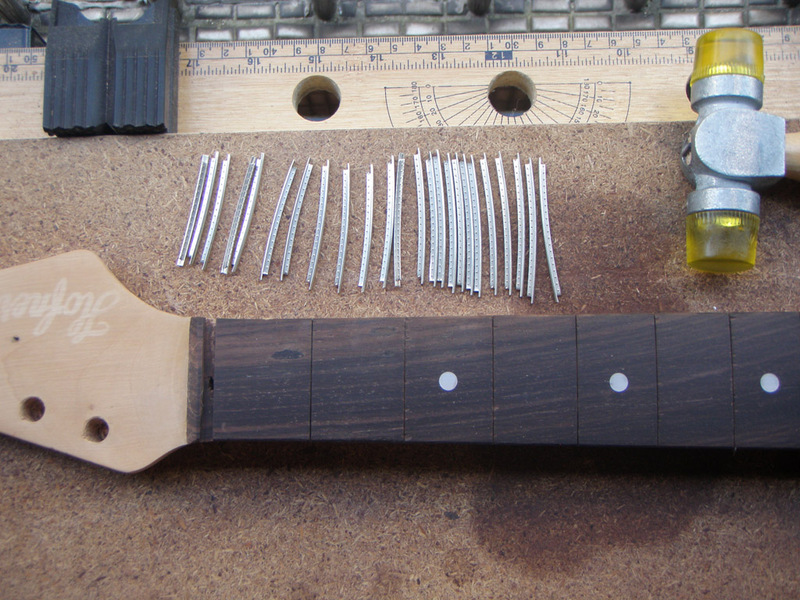 In the last blog post, we stripped down and de-fretted a vintage Hofner Colorama II neck. Today we’ll re-fret it. First of all, we need to do some initial preparation, so we lay the neck out on its jig just like in the previous post and then sort out the fret wire. 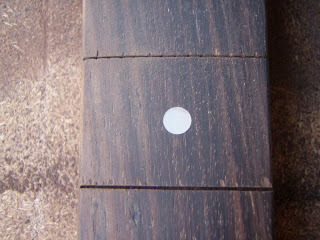 These frets have been bought pre-cut and pre-radiused. They’re not all the same length, so we need to sort them in order of shortest to longest. 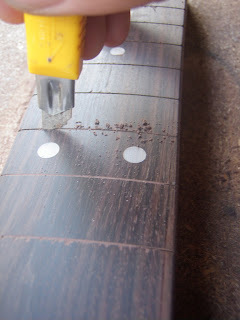 Here we’ve punched holes (don’t use the frets to do this!) 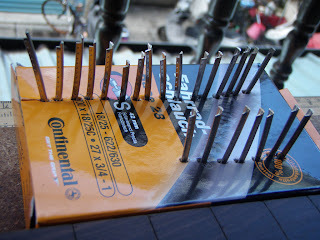 in an empty cardboard box and placed the frets in them in the correct order. Next thing we need to do is clean all of the dust, etc., out of the fret slots. A thin craft knife will suffice for this, but do it in the opposite direction to the knife edge (in other words, if the blade is pointing forwards, then pull the knife backwards). Remember, we’re not actually cutting anything here, just pushing all of the dust out of the slots. Next we take our shortest fret and do a test fitting in the first fret slot. 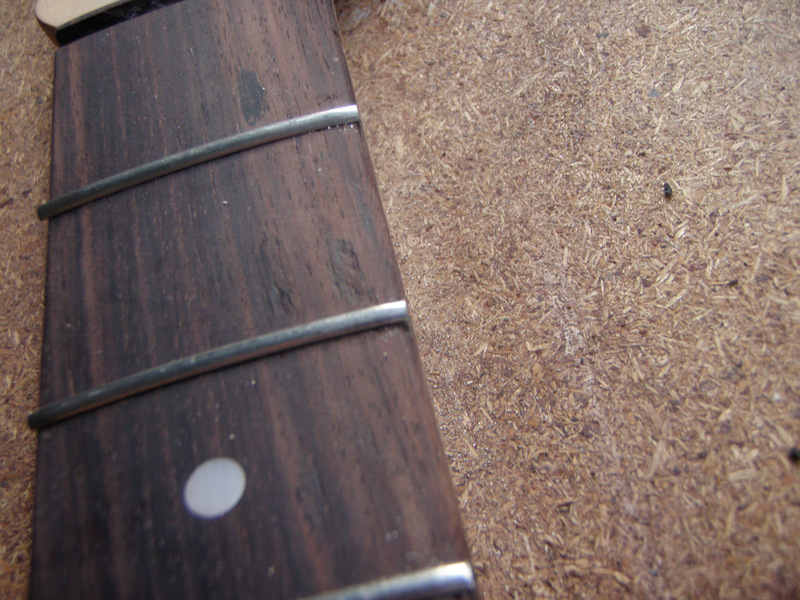 Uh-oh, it seems the fret slots on this 50-year-old neck are very thin and will need to be widened to 0.8mm in order to fit this more modern fret wire. 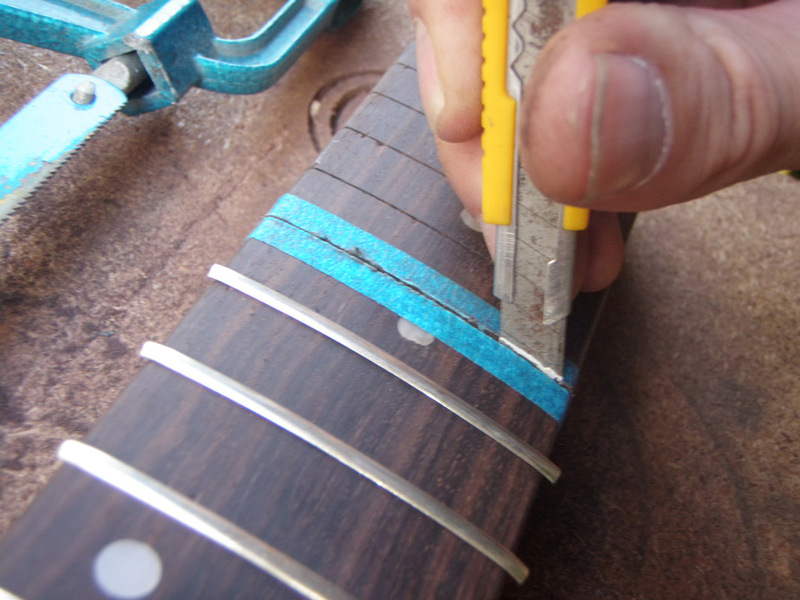 Luckily the blade on this hack saw is just the right thickness (phew), so we can continue. 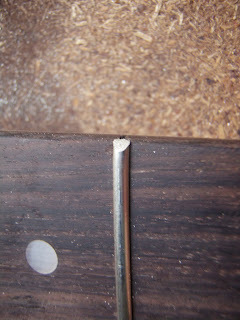 Be extremely careful cutting the slots as you can easily pull a chunk of wood off the fretboard surface by accident. Here you can see the difference between one of the original fret slots (top) and one of the new slots (bottom). 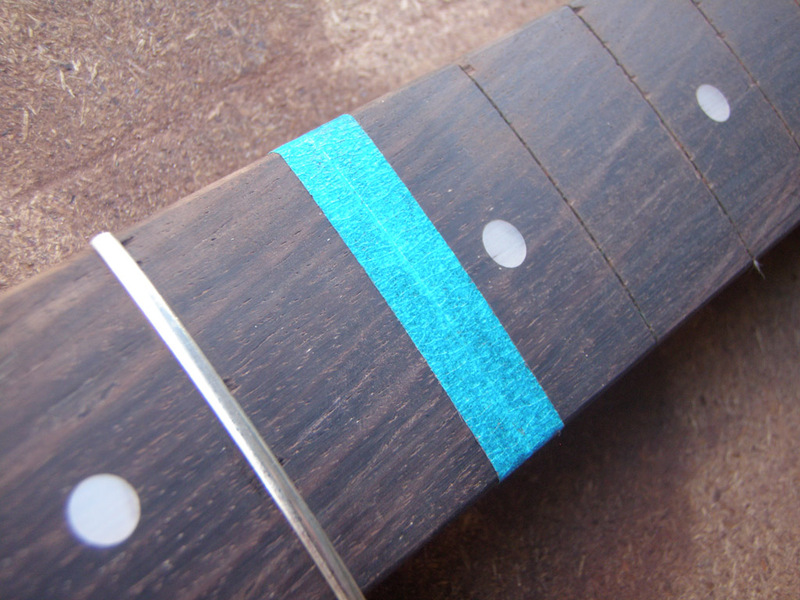 Also, you may notice that, despite extreme care, cutting the new slot has pulled up a bit of extra material from the top surface of the fretboard, so for the rest of the slots we will use tape, as follows (you can’t really see it in this photo, but if you run your fingernail down the middle of the tape, you’ll be able to make out the old slot very clearly, giving you a good guide for the hacksaw). It’s important to know how deep to cut the slots. 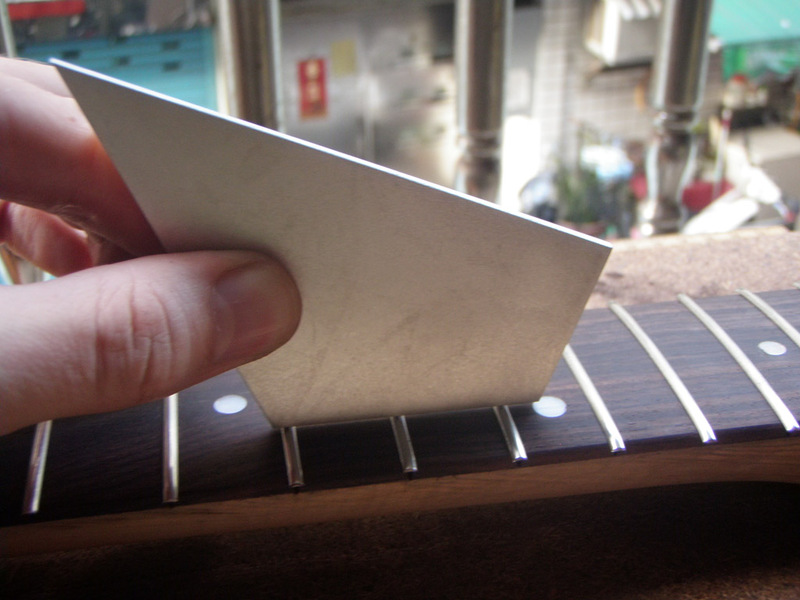 Simply measure the depth of the underside of the fret to deduce this. Here you can see a craft knife, which has been marked with the height we need to cut, being used to check the depth after we have sawed a new slot. 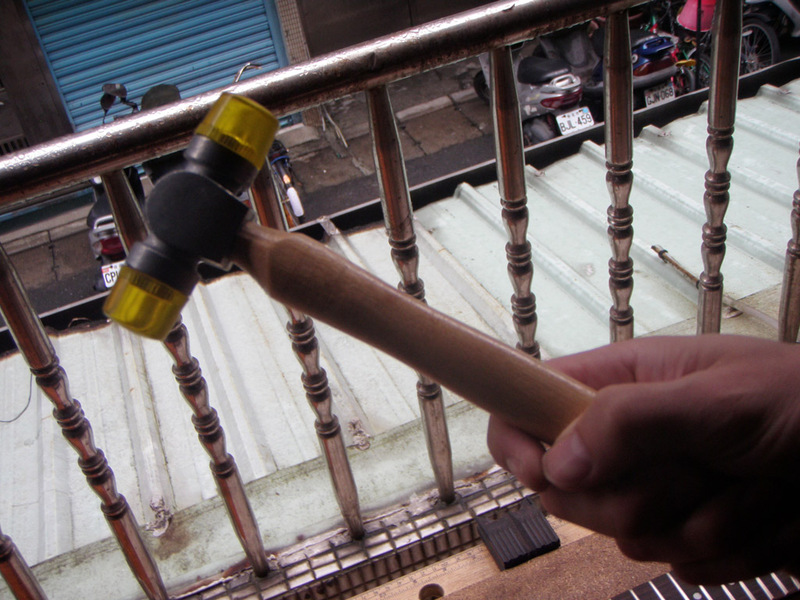 We use a plastic-faced deadblow hammer to tap the frets into place. 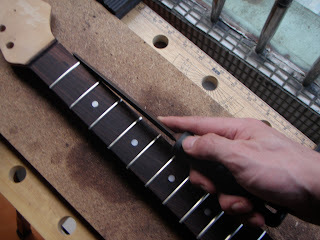 This type of hammer is very forgiving and will not damage the frets (well, unless you REALLY try), so you can just keep on tapping until they are nice and snug in the slots. 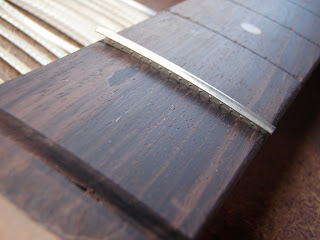 I tapped the ends of the fret into place before tapping the middle. 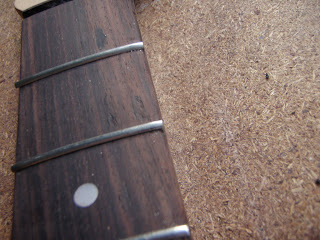 This helps the fret to not spring up at the edges at a later date. Once all of the frets have been installed, we can use a fret rocker to check if any of them are sitting too high. If so, we simply give them another tap or two to encourage them to go a bit lower. The frets are fitted, but they’re sticking out of the sides of the neck, so we use a file to file them flush with the edge of the fretboard. Then we taper the edges so we don’t rip our hands to shreds when it’s time to eventually play this thing. 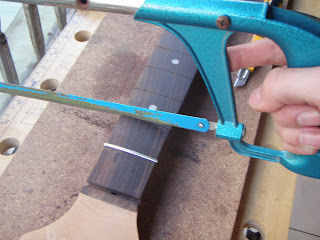 We may have to do some more finishing work on the frets (namely leveling and crowning), but we won’t know until the whole guitar is put together, especially given this particular neck’s back bow. 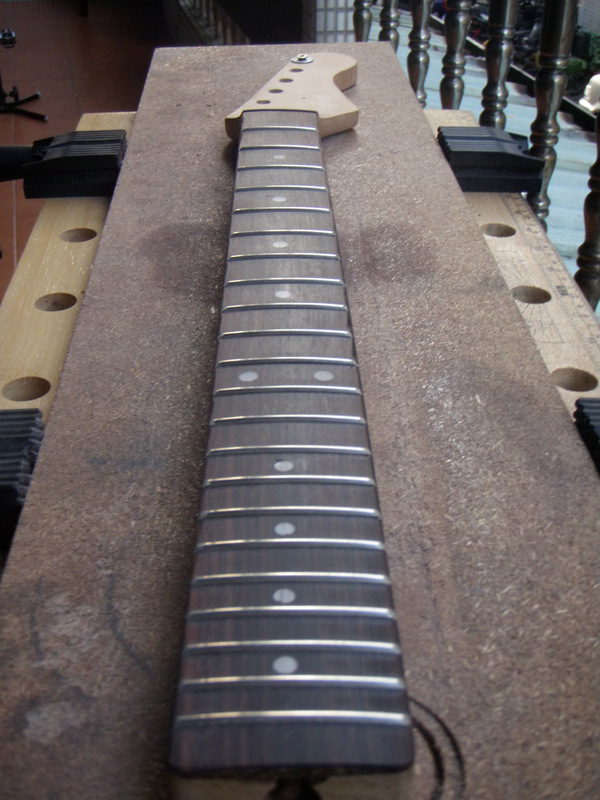 In the meantime, here’s the (more or less) re-fretted neck.